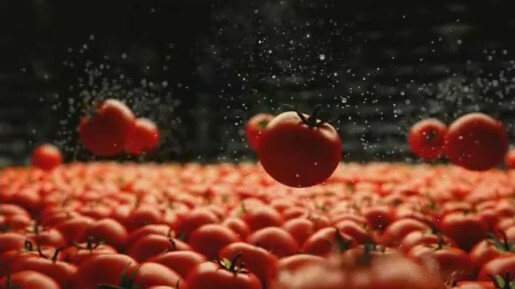 Simplot Australia is promoting Leggo’s Tomato Paste with Rhapsody in Red, an opera-inspired study of tomatoes in motion. We’re shown tomatoes vibrating, bouncing, colliding and exploding, the end product being Tomato Paste with 100 percent concentrated passion. Red tomatoes are submitted to the effects of Italian opera music, specifically “La donna è mobile” (“Woman is fickle”), from Giuseppe Verdi’s 1851 opera Rigoletto. Lyrics, in Italian, refer to the fickle nature of a woman. “La donna è mobile, Qual piuma al vento, Muta d’accento — e di pensiero.” The song has long been associated with Leggo’s advertising, evoking a connection with Italian recipes for tomato sauce. The Leggo Rhapsody in Red ad was developed at Grey Melbourne by executive creative director Ant Shannon, associate creative director/copywriter Brendon Guthrie, head of art Tim Holmes, account director Ben Dalla Riva and agency producer Jess Smith. Filming was shot by director Bruce Hunt via Revolver Film with director of photography Danny Ruhlmann. Editor was Drew Thompson at Guillotine. Visual effects and animation were done at Fuel. Sound was produced at Song Zu.